Tsukiji Fish Market has closed. It has been moved to Toyosu and renamed Toyosu Fish Market. 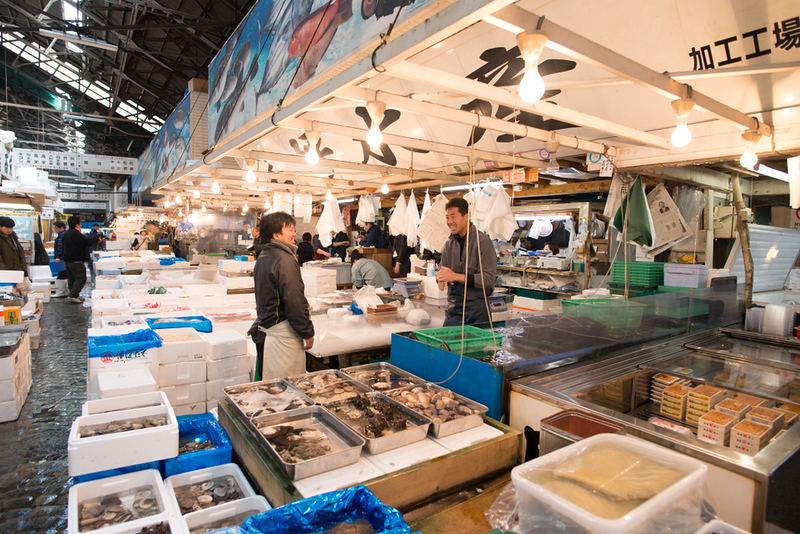 See our Toyosu Fish Market page for full details on the new market. There’s still a lot of action at the former fish market’s outer market section. There are shops selling all manner of cookware, some food items, and plenty of restaurants serving sushi and other kinds of Japanese food. It's located in the Tsukiji District of Tokyo, which is a decent walk south of Ginza and southeast of Shimbashi or Shiodome. It's easily paired with a visit to Ginza, Hama Rikyu Gardens or a trip up the Sumida-gawa River on one of the tourist boats. You can visit most of the market without special permission or a guide. Here's what you need to know to visit the market. To get there, take the Tokyo Oedo subway line to the Tsukiji Ichiba station and exit A1 and you're right there. Because the market is not an official tourist attraction, it's not well marked. You initially enter a covered parking/loading area and then make your way toward the market itself. You can usually just follow the people. If you need to ask someone to point you in the right direction, ask for "Tsukiji Ichiba".